Now, as for the equipment required, you will need a set of any three hemisphere tins or bowls that can fit inside one another. Pudding bowls are great for this if you don’t want to buy hemisphere pans, though you may need to trim it to make it round (I’ll show you how to do that). Any oven-proof ceramic bowls will work fine. If you’re using glass as I do, make sure it’s oven safe and heat treated. Some glass bowls will say ‘heat-resistant’ but that only means they won’t explode in your dishwasher. Baking times will vary based on how big your bowls are. I’ll give you some guides on that, but do keep a careful eye on your cakes and use your inner baking muse to judge cooking times. You can use any recipe you like for these cakes. For the centre, I recommend a moist recipe as the centre cake does get baked thrice. For the outer recipes, you need to use a buttercake mixture of some type. Any cake that gets you to cream the butter and sugar together at the first step should be fine, as the batter is thick enough so that the cakes won’t sink. Any mudcake, traditional sponge, oil-based recipe or one that melts the butter will probably not hold the weight of the cakes while it bakes. Lastly, for the colouring you can use any colours you like. Buttercake isn’t delicate, so you can use anything from powder, to liquid, to gel paste. If you’re not sure how much you need, add a little at a time until you’re satisfied with the result. Keep in mind that colours will lighten during baking. You can also make your own colours from things like fruit and vegetable products, and making home made food dyes is really easy. Similarly, many supermarkets sell food-derived colours so if you’re the type of person to freak out over lab-produced ones you have plenty of options available to you. As a word of caution, don’t be tempted to under-bake the cakes. I’ve had a number of people ask me if that’s the way to do it, and the answer is categorically no. When you remove the cake from the oven and let it cool, the cooking process stops. You can’t make it resume by placing it back in the oven. All that will happen is you’ll have areas of uncooked batter throughout your cake, and that will jeopardise the structural integrity as well as the look and taste of your cake. Bake the cakes to completion like you would normally and don’t worry about it being dry. By covering the cake in batter and only trimming it down at the end, as shown in the video, you’ll protect the innards for the cake and it won’t dry out. Preheat oven to 180°C (160°C fan-forced/350°F). Grease or line hemisphere tin/bowl. Sift all the dry ingredients into a medium sized bowl; combine the wet ingredients in a small jug. Pour the wet ingredients into the dry and whisk until completely combined. Preheat oven to 180°C (160°C fan-forced/355°F). Grease or line hemisphere tins/bowls. Cream butter and sugar together until light and fluffy, beat in the eggs one at a time, then beat in the almond essence and food colouring if using. Fold in flours and almond meal a third at a time until just combined. Baking times: approx 33-35 minutes for 1 cup capacity hemisphere tins. For a 1 or 2 litre bowl, drop the temperature 20°C and bake for 1 1/4 to 1.5 hours. Note: this is enough for a 1 litre pudding bowl. Double the quantity for a 2 litre bowl. If baking two halves for a sphere, use the 2.5 eggs. If only baking one, round it up to 3 eggs. Preheat oven to 160°C (140°C/325°F). Grease or line hemisphere moulds. Transfer mixture to hemisphere tin or tray and bake. Baking times: approx 33-35 minutes for 1 cup capacity hemisphere tins (bake at 180°C). For a 1 or 2 litre bowl, bake for 1 1/4 to 1.5 hours. Beat the butter until pale and creamy; beat in the milk and any flavourings/colourings to be used. Beat in the icing sugar a little at a time, until all combined. If mixture is too stiff for spreading consistency, beat it a little more milk. Your cakes look beautiful! I love how they look and the attention to details. My question is – are these cakes dry? By that I mean the inside cake ball has been baked 3 times, next one 2 times and the outside cover has gone through 1 baking. Is the cake more of a decorative display piece or something people would enjoy eaating? Can you tell me how you got the rings on the outside of the planet? My daughter has to make a Saturn cake for school next week and she has to have the rings. Thanks for your help! I used food colouring (gel paste) which I diluted with almond essence and painted it on with a brush. I’m planning on making one (or more!) of these this week for my astrophysics Ph.D. qualifying exams, but I would like to be flexible with the sizes of the cakes and the batter used. How can I know the cooking times for different batters than those shown and for different size bowls? Any suggestions? You can only know for sure with experience. Any butter-based recipe of similar ratios will have a similar baking time, but even things like your individual oven will alter it. Typically, if a recipe takes 1 hour to bake in a standard cake tin, it will take me about an hour and a half in a bowl. You really have to be familiar with the recipe you’re using. This is important because CAKE!!! That was so impressive. Great school project for my boys, and you can eat it at the end. Thankyou so much for sharing this. My pleasure! Thank you for watching. Would love to see your process of decorating it as well! If I ever revisit the project perhaps I’ll be able to document the process. The trickiest part is covering it with fondant — you’ll want to practise that on an easier cake first. Dust ring and moons cake recipe involves orbital air table tracks of cast sugar, comes off as overly twee. So if I want to make a liqueur cake of this sort, maybe I can reinforce it with some crispy facon or some gluten product? Then make sets of 2-3 knives out of hard crack sugar (on superhydrophobic gravure) to cut heptagon cores…plus a place to keep them in case the first person asks for a smaller slice. I was intrigued by the decorations of the Jupiter cake, but very disappointed when the video didn’t showed it. This cake has received a lot of press because of the decoration, but I never documented that part. The tutorial was only supposed to be about how to achieve concentric layers in a cake. I only did the outside for fun and practise, and in decorating it I was making it up completely as I went along (I actually tried painting it with buttercream first, but when that didn’t work I tried other things). Decorating it was a first time for me and a complete learning curve. I appreciate that the focus was never intended to be on your decorating technique. I’ve learned so much from your tutorial, and now have a lot to go on. Thank you very much! That being said, I have fooled around with fondant just enough to at least be able to ask if you used a poured vs. a rolled fondant? My father’s an astronomer. I can hardly wait for his birthday! LOL he will be more impressed with the concentrics and the ratios, in any event! 😀 Thank you!!! I used rolled fondant. It was marshmallow fondant from memory. I haven’t messed around with poured fondant much. It’s always much harder to get perfectly smooth and even surfaces. I’ve never tried painting on it either so not sure how that would go. Hey, love your cakes 🙂 I m planning to make the earth cake for the 17. Mai celebration (Norway’s national day). How did you manage to make the Map? Anyone want to try this? I did but mine didn’t turn out – I blame my oven! Because they are insulated by the new batter they don’t burn. if they are not covered or pushed in deep enough they may burn, but more likely they will become dry and stale. That’s why they need to be covered well. Thanks a lot!!! 🙂 you’re great! 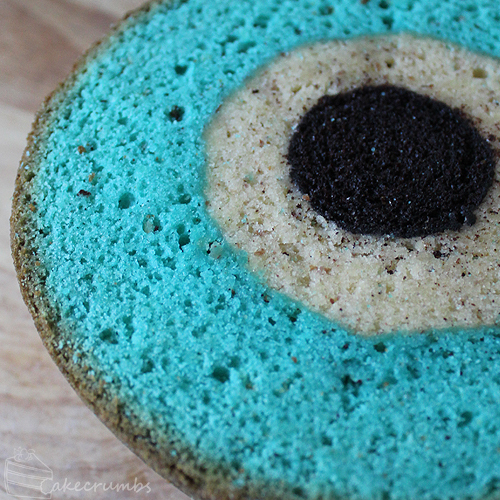 A tutorial for one of my favorite #geeky baked yummies! That’s really gr8… I had never thought that cakes can also be baked like this!! Really u r very generous that u shared ur recipe with us. I hope someday I will try it by myself!! Just one question how did u do the decorative stuff on the cake??? It’s all food colouring just painted in with very small brushes. I’m slowly working on a fondant painting tutorial to explain it. You are just amazing!!! I am going to attempt this for my twins birthday next week! Thank you! My pleasure! I hope it turns out wonderfully for you! The Jupiter cake looks stunning! And it was so amazing to see Australia in the centre of the globe on your Earth cake! Love your work! My goodness, this is just awesome!!! I just cut the continents out of fondant and stuck them onto the cake using sugar glue. I then used food dye to paint them. As far as transporting it it should be fine in a cake box or plastic container. It needs to be kept at room temperature. Thank you. We are doing it this weekend. I think I’m more excited about his homework than he is. Hi, I am writing to ask for the permission to use your figures in my academic paper. But it isa hard to find any contact information in your website. Could you reply me by email please? Thank you! Can I just use the Vanilla Madiera Sponge for all the layers? Do you have s tutorial in how you decorated the cake? Im going to try recreate this for my soon tobe 9 year son. Hes so in love with the planets.. Pray for me.